Egyptian food stalls shift koshari by the cart-load. This buttery nutmegy rice and lentil dish is served with a simple tomato sauce. Traditional versions use vermicelli noodles, we've used macaroni in their place as our kids like it. Be warned that, although making koshari is very straightforward, you'll have quite a few pans on the go at once so this is best not made on a night when you're short on steam. 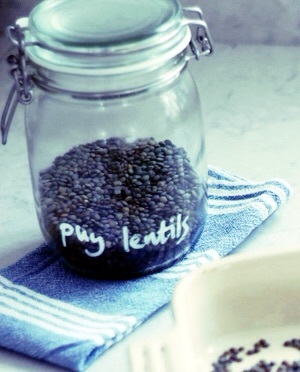 If you want, you can strike off one element by buying a pouch or can of ready-cooked lentils. It *does* take a little patience to brown and crisp up the onion - persevere as it really finishes off the dish. Make koshari at 5pm to feed the kids and it'll happily sit under a clean tea towel for a bit until mum and dad are ready to give it a quick reheat. 1. Show the kids how to peel and slice an onion. Heat the oil in a large frying pan over a medium heat. Add the onions and cook for at least 40 minutes until golden and crisping up. Don't rush this step as the crispy onions make the final koshari super-tasty. Get the kids to check on them on and off and give them a stir. Reserve a few really nice crispy ones in a bowl to sprinkle on the top at the end. 2. Meanwhile cook the rice, macaroni and lentils according to pack instructions; set aside once done. 3. Next make your tomato sauce. Heat the oil in another pan and crush in the garlic cloves (kids find this easiest in a garlic crusher as they don't have to peel the garlic which can be fiddly for little fingers). Fry for a minute then pour in the tomatoes, sugar and chilli flakes (if using). Simmer gently for 20-25 minutes until thick. 4. Once your onions are golden, the kids can add the butter to the pan along with all the spices and stir. It will smell fantastic. After a minute, tip in the cooked rice, macaroni and lentils and stir for a minute or two until piping hot. Season with salt and pepper and get the kids to rip over the coriander and flat-leaf parsley (or they can use multi-blade kitchen scissors like these although watch their fingers) and sprinkle over the reserved crispy onions. Serve with the tomato sauce dolloped over.